The Ford E-250 Econoline van saw many changes over the years that it was produced. From 1960 until 2014, every year there were updates in technology and appearance. Something that never did change was the fact that it makes a great passenger or work van. It was a best-seller from the 1980s forward. 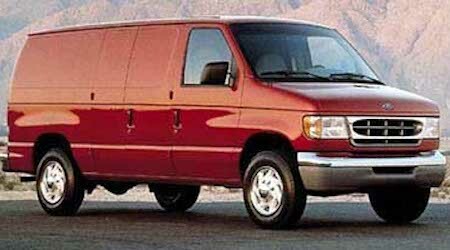 Since you rely on your Econoline E-250, you buy OEM Ford parts any time that you need a replacement part. Windshield Wipers – When it comes to driving in the rain, your windshield wipers need to be clean and fresh or your windshield will become smeared with mud and dirt. We have replacement wipers, arms, and washer pumps. Ignition – The ignition system starts the vehicle for you. If any of the parts on this system start to fail, you might find it hard to start your engine. We have switches, starters and more. Brakes - The brakes take a lot of wear since you use them every time that you drive. Check the pads for wear regularly. We have brake pads, shoes, drums, rotors and calipers. When you buy your OEM Ford parts from us, you get fast, affordable shipping and excellent customer service. Order your new Econoline E-250 parts now and get back on the road right away.